Before I get started on the HGG11 series (waiting on photos – please send yours in asap! ), I wanted to mention the new products that showed up this year (many a complete surprise). 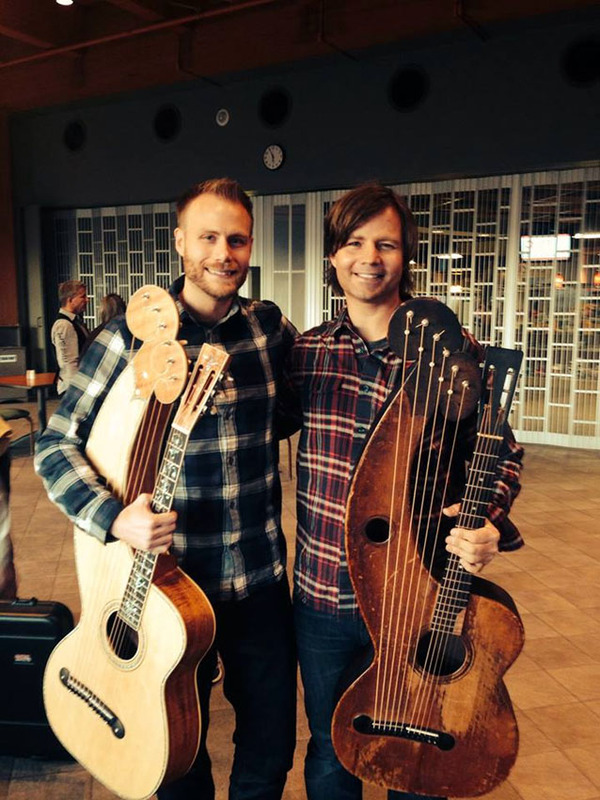 As mentioned a couple weeks ago, the new DR strings from Dan LaVoie were there (and sold well). 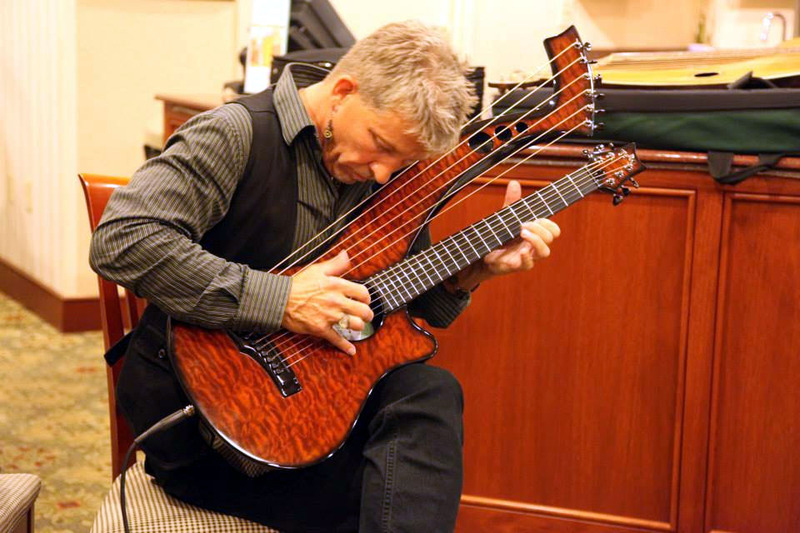 I’ve got the remaining stock arriving Tuesday, and listed on Harp Guitar Music here. 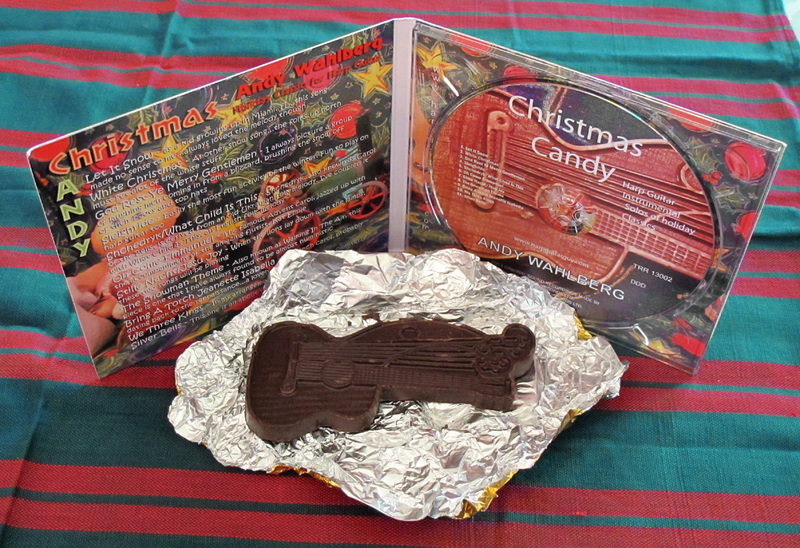 Brad Hoyt’s pre-release copies of Far Away From Everyday (which you know from last month’s blog – to go on sale soon), the first harp guitar release from Claude Laflamme, Hors d’oeuvre, and a surprise Christmas album from Andy Wahlberg, Christmas Candy. 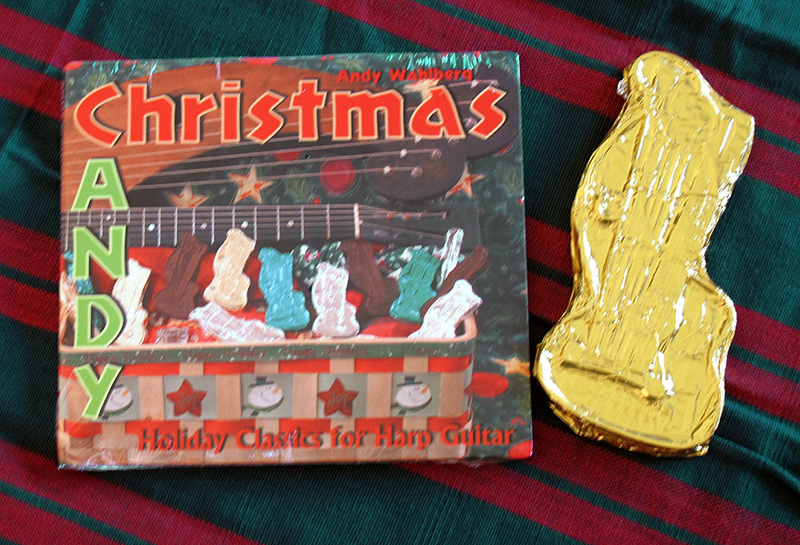 I’m listening to Andy’s as we speak (typically exuberant and impressive chops in fun arrangements). His wins the award for coolest packaging/marketing gimmick. Christmas Candy (alternately “Christmas Andy” via the color-coded font) includes an actual piece of candy – a Dyer harp guitar candy bar in dark Belgian chocolate, handcrafted by his wife, Kitty! I’ve resisted biting into it, hoping I can shellac it or something to preserve for my collection. Andy isn’t yet sure how these will mail. 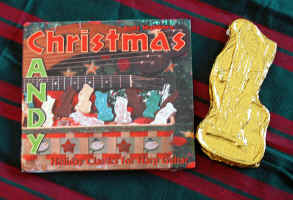 Neither am I (l plan on placing in separate Ziplok bag so that if it melts into a puddle, it won’t chocolate-coat the actual CD). Too cool. 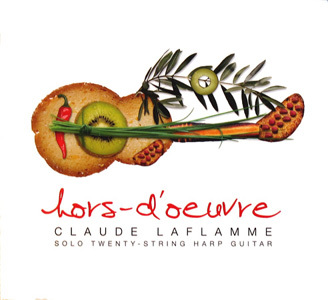 Claude’s CD also has a great cover concept – Hors d’oeuvre features an image of Claude’s 20-string Pellerin harp guitar made entirely of, well, actual hors d’oeuvre. One almost wishes his was edible like Andy’s! The album is a stand-out, with maybe half of the pieces (originals and covers) music we lucky Gathering attendees have heard over the last 3 years now. My favorites are two originals I hadn’t yet heard (a mainly 7/8 piece with occasional Hedges-style ostinato is killer). Though I wish it was a slightly longer album, Claude’s impeccable rhythm and recording quality do not disappoint. HGG11 T-shirts (modeled above by our host John Thomas) are nearly sold out. I think we have 1 Small and 2 XXL if anyone wants a “wish I was there!” souvenir. It features our Evolution graphic from HGG5. The bumper sticker looks just like the banner below (proudly hung above the Sunday concert stage) – plenty available if you’re interested. 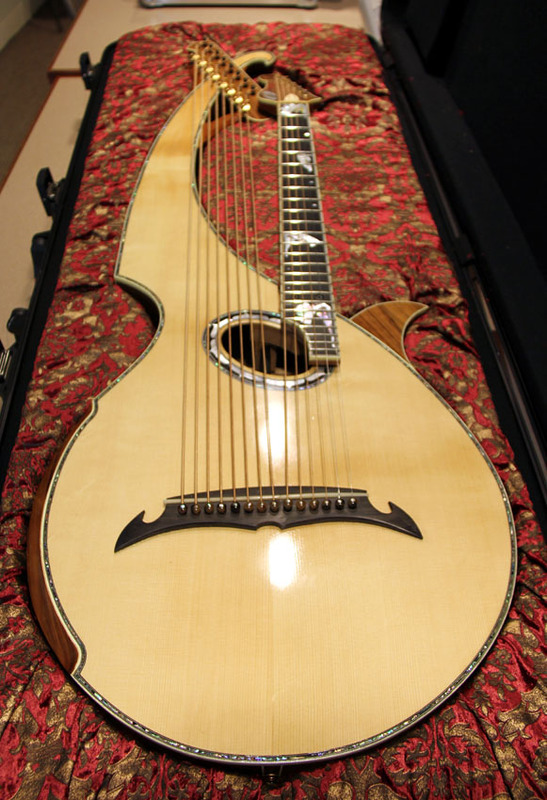 A brand-new Emerald carbon fiber harp guitar with wood-impregnated top (I know that’s the wrong description, you’ll just have to see it!) courtesy of Alistair Hay (attending), played (aggressively) by Stacy Hobbs, above. 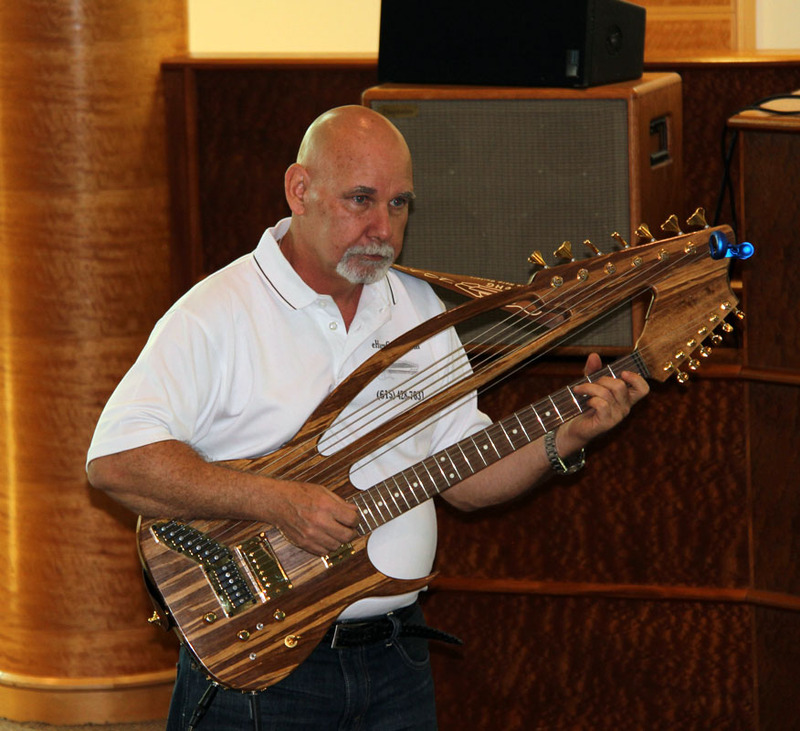 One of Chuck Thompson’s outrageous new bamboo electric harp guitars. 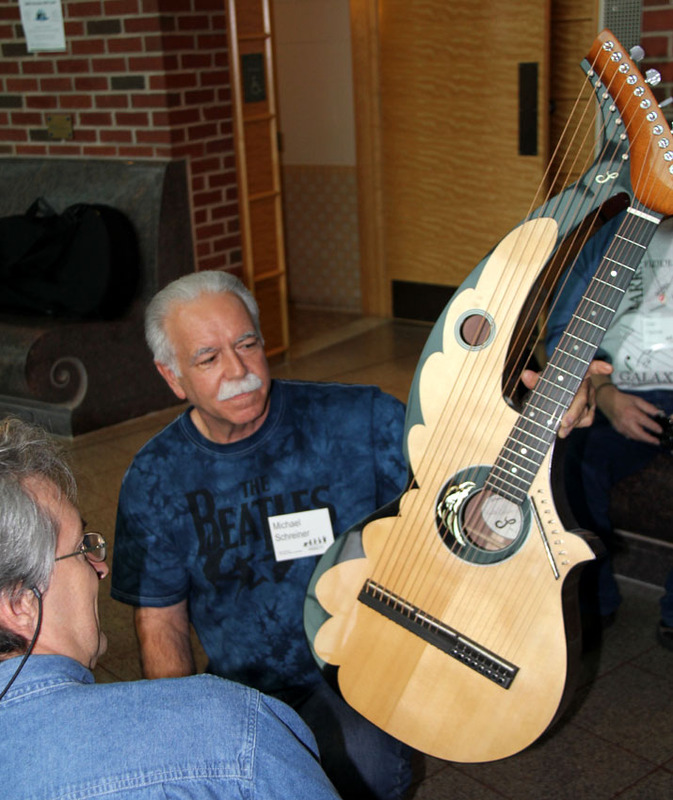 Michael Schreiner also built his third – a cross between a Sullivan/Elliott and a Mozzani Aquila! 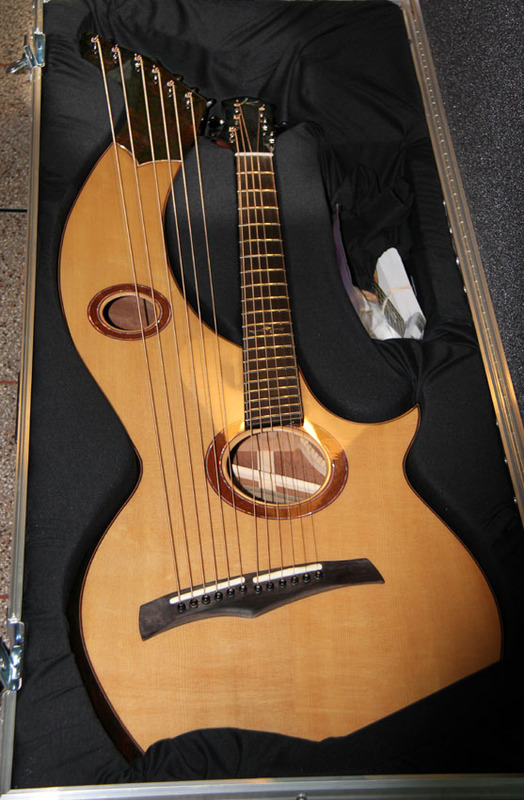 A second, fan-fret 21-string for Claude Laflamme by Michel Pellerin (who also attended). Jealousy, envy and lust were all in abundance last weekend! Cool pics! Especially of me.. 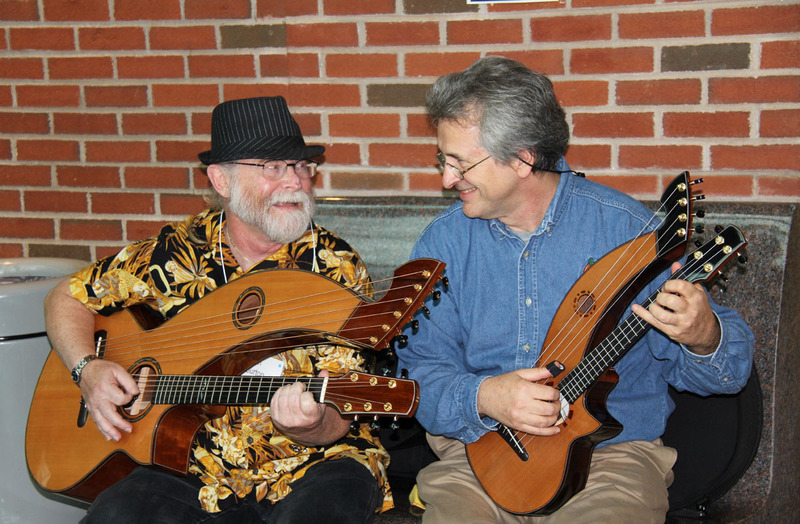 I have been listening to Claude’s CD at my store all day, every day and telling everybody about what a harp guitar is. A great description of all, Gregg! 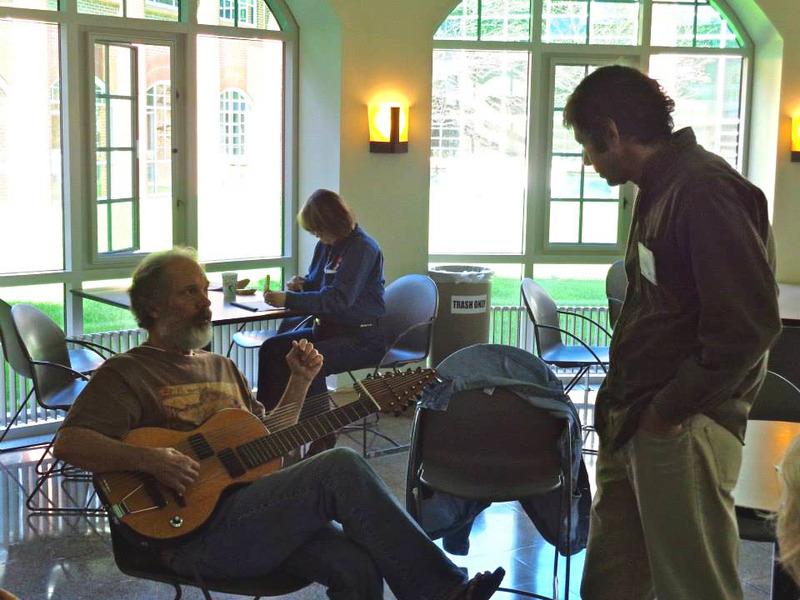 We’re still floating on our cloud from getting to play with the heavy hitters on Sunday afternoon, and, as always, from our annual family reunion. Words fail when trying to tell how much having this wondrous gang welcome us into the fold means to us. We have some legendary candid shots to share and will send them as soon as we get back to Ioway–or sooner, if I can get the time between our stops. Vickie and I indulged in Brad and Claude’s new CD’s. We also picked up the Kalamazoo Gal’s companion CD, Andy Wahlberg’s Beatles cover CD, and Andy McKee’s “Dreamcatcher.” We played all five CD’s over and over all the way home to Atlanta! SWEEEEET! Jealousy, envy and lust were not the only things in abundance last weekend. There was also warmth, humour, friendship and fellowship. How complete strangers can became great friends after just a few hours is something one must experience for ones self to truly understand. From those first great bear hugs Linda and I received on Friday to the last wave through a window on Monday morning. 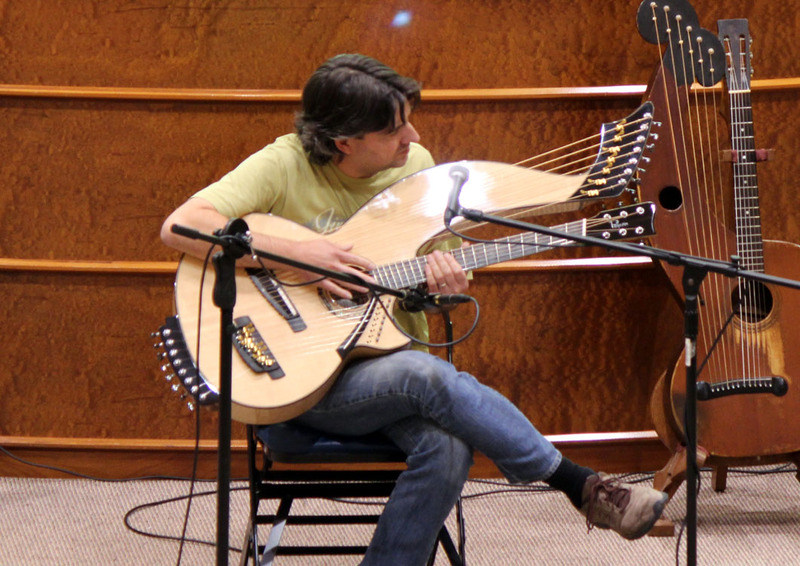 Another FUNtastic Harp Guitar Gathering has become more great memories to share. In reference to all the great gear that was on sale there is more thing you need to add to your list Gregg. That being the cold, hard slap of financial reality that smacked me (or was that the wife) after playing Tony’s HG. I’m reminded of an old saying, I’m not afraid of dying but I’m very concerned that after I’m gone the wife will sell my guitars for what I told her I paid for them. Ba-Dum bum! This is the Album (CD) of the Year!!! I purchased a copy at HGG11, but didn’t listen to it till I returned home. It has been played everyday in our home since. My wife Cindi, who hates to listen to songs over & over, due to my addiction to Pat Metheny music,has chosen to listen to no other music till Nov 1st when Gregg’s Christmas CD’s will take the top spot. I recommending to all reading this,to get Brad’s new CD. This would make an awesome Christmas present to any serious music listener. Fantastic JOB Brad & Gregg.